Cycling advocacy is alive and well in Toronto, and it knows how to party! 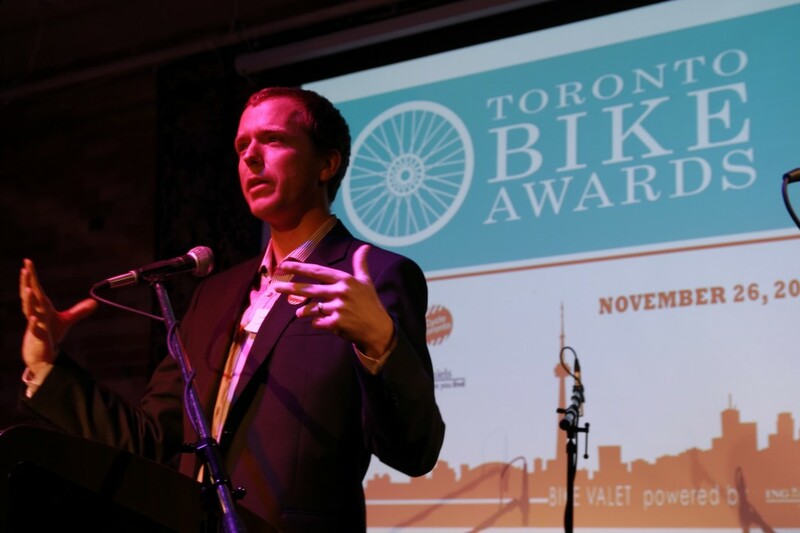 A large and enthusiastic crowd came out to the Gladstone Hotel Ballroom on the evening of November 26 for the 2013 Toronto Bike Awards. The awards honoured individuals and organizations from both business and the community who have shown leadership in making Toronto a better place for cycling. City Councillors were on hand to present awards and schmooze with the cycling public, while the evening's entertainment was provided by local songstress Paula Perri, artful indie rockers HIGHS, and two short films by VeloReel. The ceremony was co-hosted by Jared Kolb, Executive Director of Cycle Toronto, and Tonya Surman, CEO of the Centre for Social Innovation. It is originally an initiative of the City of Toronto. Here's a quick recap of the winners. Congratulations to everyone! And a big thank you to all the cycling advocates who work every day to make Toronto a better place. 1. The award for “Best Skills Development” was presented by Councillor Ana Bailao to Pedalheads, a cycling education company. 2. The award for “Best Bike Parking”, presented by Councillor Adam Vaughan, went to local digital advertising agency Stone Canoe for their creative canoe-shaped workplace bike rack. 3. Councillor Gord Perks presented the award for “Best Bicycle Commute” to software company Intelliware Development Inc. for being an exceptionally bike-friendly workplace. 4. Councillor Joe Mihevc presented the award for “Best Small Business” to the law firm Macleish-Orlando LLP for both their bike-friendly office (featuring showers and underground bike parking, among other amenities for cyclists) and their cycling-related pro bono work. 5. The “Best Large Business” award was presented to ING Direct by Councillor Anthony Perruzza for the bike-friendly features of some of their bank branches, and for sponsoring cycling-related activities around the city – including the Bike Valet at this very awards ceremony. 6. The “Best Overall” category, presented by Councillor Mary McMahon, went to energy management firm Energy@Work (seen above). 1. The “School Cycling Champion of the Year” award went to TDSB Trustee Pamela Gough. 2. The “Bike to School Bike Friendly School of the Year” award went to Central Commerce Collegiate. This school has the 1st for-credit course for bike repair! 3. 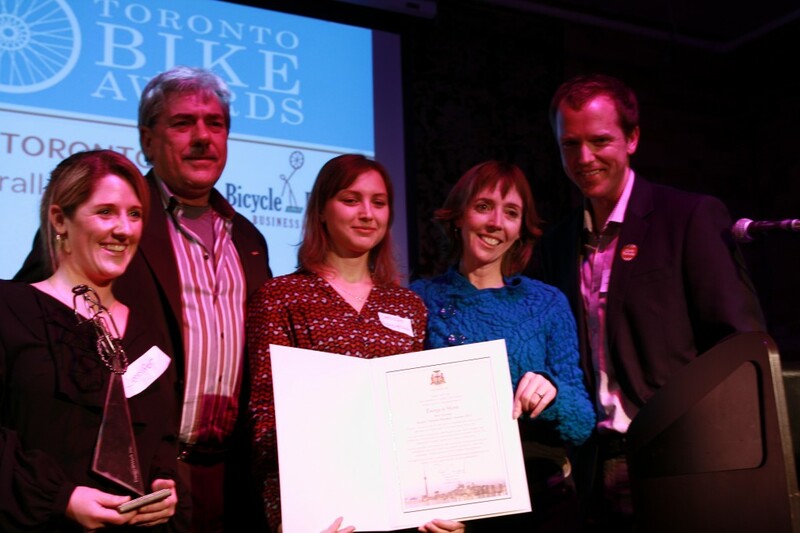 “Transportation Options Best Cycle Tourism Partner” award went to Toronto Bicycle Tours. 4. The “Charlie’s Freewheels Supporter of the Year” award went to the Downtown Yonge BIA for rescuing abandoned bikes and donating them to Charlie’s Freewheels. 5. The “Evergreen Bike Works Emerging Leader” award went to Parag Kapoor for his work with Evergreen’s Community Bicycle Hub program. 6. The “TCAT Active Transportation Champion of the Year” award went to Dr. Monica Campbell of Toronto Public Health for her work on cycling and active transportation. 7. 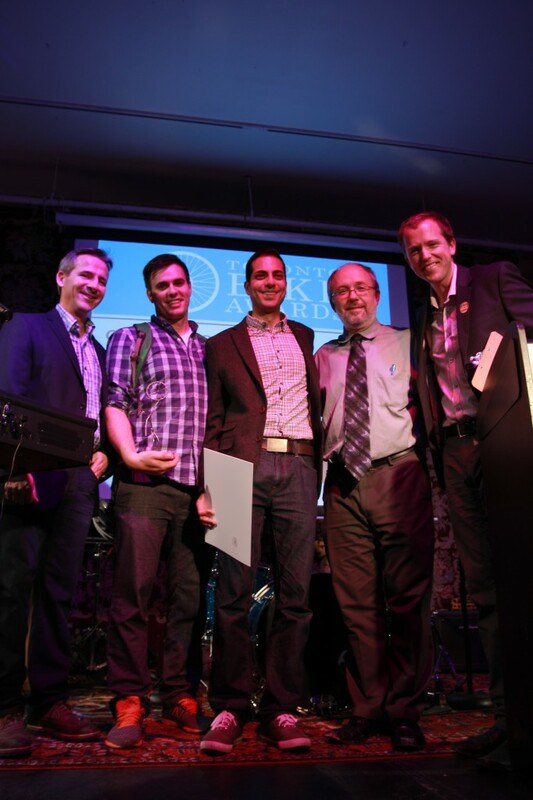 Cycle Toronto’s “Supporter of the Year” award was presented to Urbane Cyclist. 8. 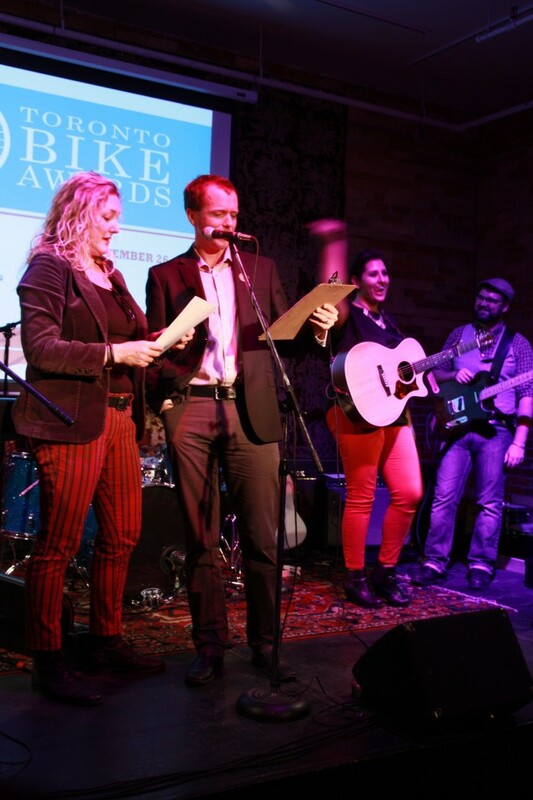 Cycle Toronto’s “Ward Advocate of the Year” award, honouring individuals who have shown leadership in putting grassroots pressure on City Council on behalf of their neighbourhoods, was split three ways by Laura Pin, Liz Sutherland, and Burns Wattie. 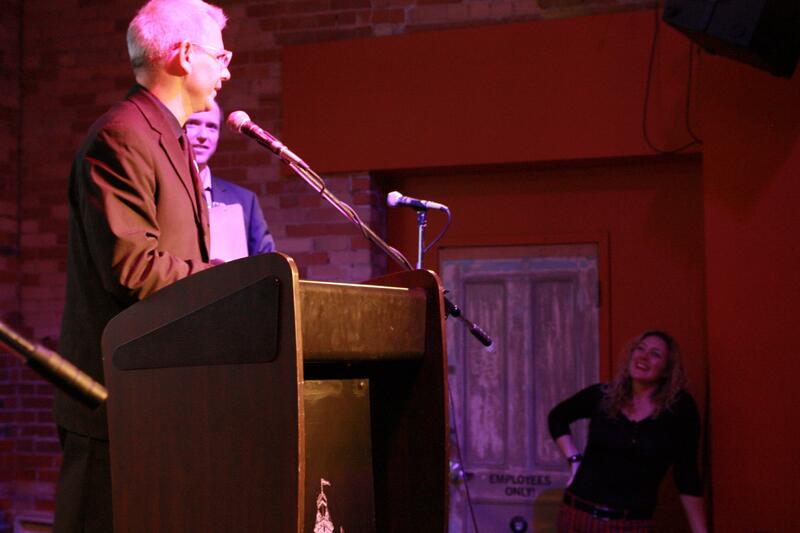 Cycling Councillor Adam Vaughan presents best bike parking award. Councillor Joe Mihevc presented the best small business award to law firm McLeish Orlando. 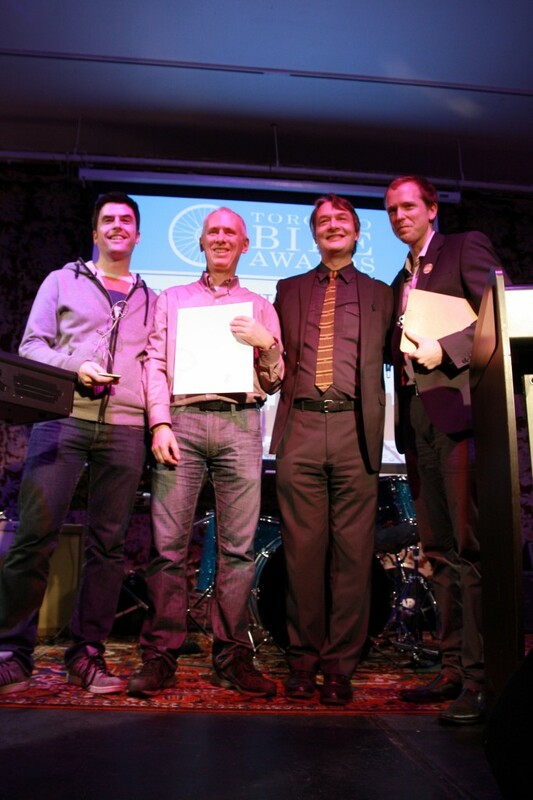 Councillor Gord Perks presented best bicycle commute to Intelliware. 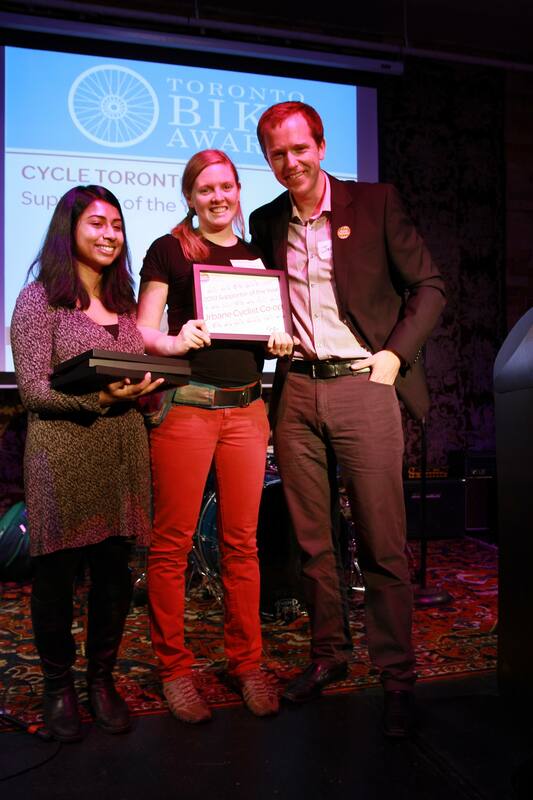 Kathleen from Urbane Cyclist received their award for "Supporter of the Year" from Cycle Toronto. 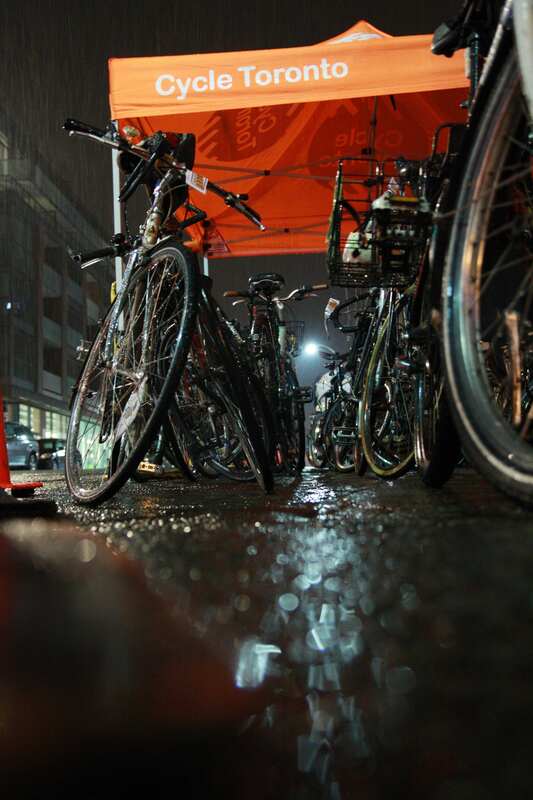 Valet parking - provided by Cycle Toronto and ING Direct. ING Direct won best large business.